Geomorphological Fieldwork addresses a topic that always remains popular within the geosciences and environmental science. More specifically, the volume conveys a growing legacy of field-based learning for young geomorphologists that can be used as a student book for field-based university courses and postgraduate research requiring fieldwork or field schools. The editors have much experience of field-based learning within geomorphology and extend this to physical geography. The topics covered are relevant to basic geomorphology as well as applied approaches in environmental and cultural geomorphology. 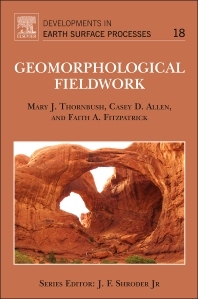 The book integrates a physical-human approach to geography, but focuses on physical geography and geomorphology from an integrated field-based geoscience perspective. Dr. Mary J. Thornbush is a trained geomorphologist and currently a member of Oriel College. Her research in urban geomorphology began in 2002, when she undertook urban work in environmental geomorphology as part of Geography and the Environment at the University of Oxford for her doctoral thesis investigating Traffic pollution and urban limestone weathering: central Oxford, England (2005). The study was revisited most recently from an urban sustainability perspective in Vehicular Air Pollution and Urban Sustainability: An Assessment from Central Oxford, UK (2015) and was included in a special issue entitled Geography, Urban Geomorphology and Sustainability in the journal Area (2015). Since 2007, Dr. Thornbush has participated in a cross-disciplinary study on rock weathering in urban churchyards that has also contributed to urban geomorphology in books such as Photographs Across Time: Studies in Urban Landscapes (2015), Heritage Stone Conservation in Urban Churchyards: Merging Necrogeography, Historical Archaeology, and Geomorphology (2018). Though well-regarded in the fields of geomorphology, rock/cultural stone decay, and humanistic geography, Dr. Casey D. Allen’s passion rests in helping people explore and discover landscapes as Traditional and Romantic Geographers. A first-generation college student and award-winning teacher-scholar with broad interests, he has been as a professional academic advisor, created and supervised several successful academic and support programs, was selected as a Fulbright Scholar, National Science Foundation Fellow, and Early Career Scholar in Geographic Education, and held various faculty and administrative positions at several universities – including earning tenure at the University of Colorado before serving as Lecturer of Earth/Environmental Science for the Faculty of Science and Technology at The University of the West Indies Cave Hill campus in Barbados. Along with his penchant for travel, Dr. Allen also retains interests and expertise in soils and biological soil crusts, landscape/geoarchaeology, rock art, botany, and regional studies. Follow him on Twitter (@caseallen) and see his website (caseallen.com) for more. Dr. Faith Fitzpatrick is a Research Hydrologist at the U.S. Geological Survey, based out of the Wisconsin Water Science Center in Middleton, Wisconsin, USA. She has been working on field-based fluvial geomorphology studies for over 30 years and has spent much of her career studying river behavior in the Great Lakes region. Her interests involve human and climate change impacts on river evolution and sediment regimes, alluvial chronologies, linking sources and sinks of stream sediment and nutrients, stream restoration and habitat, and tracking sediment-related contaminants. More recently she’s been working on fluvial dynamics in Great Lakes rivermouths. Stream issues that she’s been involved with range from urbanization, agricultural runoff, and deforestation. She teaches fluvial geomorphology and sedimentary records courses and field training at government training courses as well as the University of Wisconsin-Madison. One of her growing areas of interest is the role of fluvial processes in the behavior and fate of submerged oil and oiled sediment in riverine freshwater environments. From 2011-14 she served as Scientific Support Coordinator for the U.S. EPA’s emergency response to the 2010 pipeline release of diluted bitumen into the Kalamazoo River, Michigan, USA.